"Come with me to the men's room!" I'd never had an interview subject say that to me until I met John Gizzi. It was in the D.C. office of NewsMax Media that the longtime White House correspondent invited me to the washroom so he could continue telling me a colorful anecdote. Why not, I thought. So I followed him in—the stories were just pouring out of Gizzi that day. Gizzi is chock-full of stories. He's been covering politics since 1979 and has been a fixture at White House press briefings since 2001. But the 62-year-old journalist isn't showing any signs of slowing. He gets called on regularly from his seat six rows back, dead center. His questions are in-depth and cover a global expanse. He is also a meme. It happened on March 13, 2017, during a press briefing with Sean Spicer. While the Daily Mail‘s Francesca Chambers was asking a question, Gizzi sat quietly behind her, his glasses perched on his forehead. Then, with a quick flick of his eyebrows, the glasses fell back onto his nose. It was caught on camera and, although it doesn't sound like much, it went viral. Tonight Show host Jimmy Fallon mentioned it in his monologue. As Gizzi explained over lunch at Kellari Taverna, "When I was growing up in the Hartford area, Newington, Connecticut, the political boss of the state was a man named John Bailey. He was the Democratic state chairman for 30 years. He was Democratic national chairman under John Kennedy and Lyndon Johnson. He was bald, he had a big unlit cigar, and he wore horn-rimmed glasses." Like Gizzi, Bailey often had those glasses resting on his forehead. "And on the very rare occasions you'd see him on television, he'd wear his glasses like that. Then he'd make a pronouncement on something, and he would let them drop. Now, I always enjoyed watching that. It symbolized his power and his thinking." We must have spent a good 20 minutes on Boss Bailey, simply by my asking about those glasses. (Gizzi calls them "Goldwater glasses"; the brand is Safilo). "One of the things I admired about Chairman Bailey," noted Gizzi, "he was thinking way down the road. He had women on the ticket in 1958. Ella Grasso was secretary of state, third-highest constitutional office. And then he eventually pushed her to run for governor." At which point Gizzi was off to the races, recounting the Connecticut state elections of 1962. "Gizzi's able to recall anything political, whether it is races, or relationships," said Republican congressman Todd Rokita of Indiana. Rokita interned at Human Events in 1992. "I have never seen someone in the industry with such an encyclopedic memory of history and politics." Ari Fleischer echoed the sentiment, calling Gizzi "a walking-talking encyclopedia." Fleischer, who served as President George W. Bush's first press secretary, said Gizzi "remembers virtually every detail about every obscure race in every corner of America, and he's just an entertaining joy to be around if you like politics. … If the category was politics or history, I would not want to be on Jeopardy! against John." For instance, said Fleischer, "He could tell you to this day who ran in that race I worked on in 1982, who the obscure New York State assemblyman was, who lost, who was my boss, to how many seats Republicans lost overall in the 1982 election." "Jon Fossel," Gizzi answered without hesitation when I brought up Fleischer's remark. He even pointed out the spelling of his first name, without the "h." Who did he lose to? "Ottinger. Richard Ottinger. Whose great uncle was the Republican nominee for governor of New York in 1928, which was a big Republican year, but he lost to a young Democrat named Franklin D. Roosevelt in a big upset." And exactly how many House seats did Republicans lose in 1982? "Twenty-six. It was an awful year. And the sad part: 1980, I knew a lot of the members who came in. There were 34 Republicans who were elected on Reagan's coattails." Gizzi went on to name just about all the "one-term wonders" who were turned out after two years, including Clint Roberts, "the Marlboro man in commercials. He just died—and not related to cigarette smoking." Gizzi was born in Hartford in 1955 and grew up in nearby Newington. "I always wanted to do something in politics. But the writing—that developed by osmosis. I found in college I like to write a lot." He attended Fairfield University, also not far from his home. But upon graduating he traveled down to Texas to work for the Travis County tax assessor's office. In 1979, Gizzi came to Washington and began writing for Human Events. He's always had a conservative disposition and was an avid reader of National Review as well as the publication he came to work for. As for his writing, Gizzi considers Advise and Consent by Allen Drury "a pivotal book in my life." Naturally Gizzi ended up befriending the late author. Drury signed a first edition of Advise and Consent for his wife Colleen, perhaps one of the two most prized books in the Gizzi house—the other is Reagan's memoir signed by the president. "If there was ever a fire at our home," Gizzi's wife told him, "the books go out, then the jewelry, then me." Getting all that out might leave him winded. "I need to lose 30 pounds," Gizzi admitted during our lunch (he ordered the white bean soup, grouper, and sorbet). "I weigh 250 and my doctor says everything from that—the blood pressure, the tightness in the clothes—it all comes from that." In 2012, he tried the Dukan Diet, which, he informed me, "is very popular in France. Princess Kate, when she got married, went on it. François Hollande, the former president of France, lost 30 pounds in a few months. And I dropped a lot. And I was watching a clip of myself on C-SPAN. I was on Washington Journal, and I wore a three-piece suit that day, and I looked pretty good." But we both agreed the camera adds 15 pounds (so he only looks like he weighs 265). "That's why you see so many of the reporters at the White House are a lot thinner in person," Gizzi pointed out. "I introduced [NBC White House correspondent] Peter Alexander to my wife recently. He's very thin in person. He looks good. [CBS White House and foreign affairs correspondent] Margaret Brennan, all of them, men and women, are very thin in person. But on TV they look fine." With regard to his fellow members of the press corps, Gizzi is kind and respectful. He calls them "a bright group," which is why he only prepares three or four questions per briefing—someone will inevitably cover the same topic. But those few questions he brings are fully researched and backed up. It's something he learned the hard way. In May 2010, Gizzi asked Obama press secretary Robert Gibbs, "What's the administration's reaction to the news that Halliburton has just been given a $568 million no-bid contract by the administration?" Gibbs responded, "On what issue?" Gizzi drew a blank. The best he could muster was, "Not sure yet what that was." Gibbs retorted, "Well, how about we reconnoiter on both, and we'll figure that out." Prior to last Thanksgiving, Sanders encouraged reporters to preface each question with thoughts on what they were thankful for. Gizzi said, "I'm thankful for the position I have and the colleagues who are my friends. I'm thankful for my father—96 years old and going strong; and to my wife, my heroine, thankful to her for saying yes on the fourth request. My question is about Zimbabwe." Again this brought laughs and prompted Sanders to say, "That's the best pivot I've ever seen." Gizzi is indeed thankful for his wife, the former Colleen House. "I wanted to marry her the first time I met her." It was in the late 1980s that they first met, but Gizzi had known about her for years. He cited a Newsweek issue from 1974 about women in politics. "And among the women they focused on in a very big Democratic year was a Republican who had won a race for state representative in Michigan, Colleen House." House was 22 at the time—still, according to Gizzi, the youngest woman ever to serve in the Michigan legislature. As for the colleagues Gizzi is thankful to call his friends, there are many—especially members of the foreign press. Laure Mandeville, the former Washington correspondent and current senior reporter at large for Le Figaro, first met Gizzi while covering the Obama White House. "I must tell you that he was really one of the kind people there," she said. "It's not always the case. You know, most of the American reporters are very busy and not particularly paying any attention to these foreign reporters. And John was always very interested in knowing people from Europe and from all over the world." The two started talking about French politics. "He knew [Jacques] Chaban-Delmas, old French politicians…. And I was just amazed that John Gizzi knew Jean Royer. He was a sort of conservative, right-wing politician, who became well known for the fact that in 1974, to protest his conservative views, a lot of French women would go to his political meetings and show their breasts." During our interview, Gizzi spoke at length about the future of Germany's governing coalition and the peaceful transition of power in Nigeria. "He's very well read," agreed Dana Perino, former press secretary to George W. Bush. "His historical knowledge leads him to ask highly pertinent questions—press secretaries like those kind … well, usually!" Perino's counterpart in the Obama White House, Josh Earnest, said Gizzi "didn't shy away from asking off-beat questions to get a reaction from the White House. 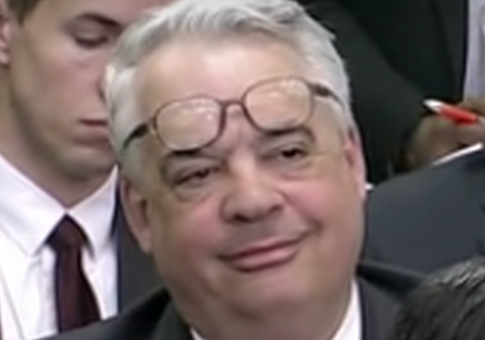 My advice to anyone taking a question from John Gizzi in the briefing room: You'd better have done your homework—because you never know what he's going to ask." The question Gizzi asks most likely will be a two-parter. "His signature move after he gets called on," said Perino, "is to say, ‘Two questions please…' Never three. Never one. Always two." These days, said Gizzi, "Sarah makes it difficult [for follow-ups], but I don't blame her. She's got a very crowded room. And she does try to give people, regardless of their views, a crack at a question." Although Gizzi refuses to rank press secretaries, the late Tony Snow is probably "close to the top." Snow, who served under George W. Bush and died of cancer in 2008, "was prepared for everything. … Every answer was a sound bite. He was very accessible." He considers Robert Gibbs "very good" even though "he made us wait a lot of times." Gibbs also once took away Gizzi's cell phone for interrupting the briefing, an incident also covered by Huffington Post. "Oh, that was something. But you know what? I never minded any of these things because when he said he was talking to the president, you believed it. Instantly. He had a relationship like Pierre Salinger did with John F. Kennedy." Former Obama press flack Jay Carney, on the other hand, is likely near the bottom. "I can take or leave him," Gizzi said icily. "He was very, how do I put it, sensitive to the point of being insensitive. If he disagreed or didn't like the way you asked a question, he'd put you in Siberia. I don't wish him ill, but he's not on my Christmas card list." So how would press secretaries rate Gizzi? "I've known John for a long time," said Sean Spicer. "He has always been a thoughtful and highly insightful journalist with the highest degree of professionalism and integrity." Perino said she "really appreciated John's presence in the briefing room, and I'm honored to call him a friend today." "John, unlike many in the briefing room, would not chase the hot controversy of the day," said Ari Fleischer. "John's questions were bigger picture and often more about enduring matters, not just what was going to lead the cable shows that day." Fleischer described Gizzi's knowledge as "factual, it's historical, it's not polemical. And that's what you want in a reporter." Earnest called Gizzi "an old-fashioned D.C. reporter." To be clear, he added, "I mean that as a compliment. He writes for an outlet with a point of view that often, if not always, was at odds with the Obama administration agenda. But, my experience is that John was unfailingly polite, collegial, and respectful of me and my staff." Old fashioned is right. 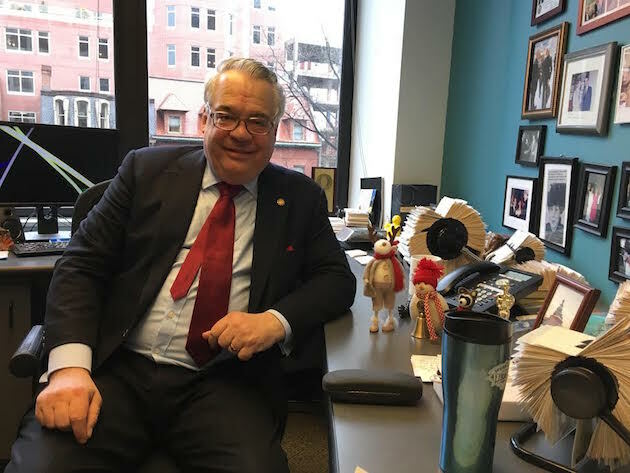 Gizzi's NewsMax office is crammed with filing cabinets and boxes of correspondence—a miniaturized version of his working space at Human Events, which folded in 2013. His walls are covered with framed photos spanning the years—Gizzi with Richard Nixon, Gizzi with George W. Bush, Gizzi with Reagan, Gizzi with Sonny Bono. Also framed is a quotation from Harry Truman: "Work hard, do your best, keep your word, never get too big for your britches, trust in God, have no fear, and never forget a friend." Gizzi is also flanked by his rolodexes—all 53 of them, organized alphabetically. There are 90 countries on three rolodexes alone. There are countless manila folders filled with correspondence, also alphabetized. "Real letters," he pointed out. "You and I could become blood enemies, just responding on the email. And it's gotten ugly with some people. And Twitter. But when you sit and compose a letter, you know, just like when I've challenged parking tickets I've received, or I've written a response to someone who didn't like an article or something I said, you're forced to think about it, and you become an editor every time. Irving Kristol was a great letter writer." After our interview, Gizzi said he was going to mail out five letters—"four thank you notes and a complaint to Uber." Those damn cancellation fees. This entry was posted in Culture and tagged Feature. Bookmark the permalink.